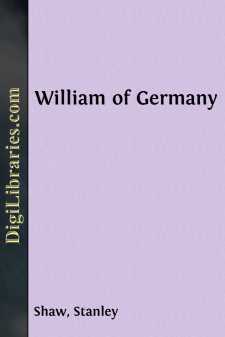 William the Second, German Emperor and King of Prussia, Burgrave of Nürnberg, Margrave of Brandenburg, Landgrave of Hessen and Thuringia, Prince of Orange, Knight of the Garter and Field-Marshal of Great Britain, etc., was born in Berlin on January 27, 1859, and ascended the throne on June 15, 1888. He is, therefore, fifty-four years old in the present year of his Jubilee, 1913, and his reign—happily yet unfinished—has extended over a quarter of a century. The Englishman who would understand the Emperor and his time must imagine a country with a monarchy, a government, and a people—in short, a political system—almost entirely different from his own. In Germany, paradoxical though it may sound to English ears, there is neither a government nor a people. The word "government" occurs only once in the Imperial Constitution, the Magna Charta of modern Germans, which in 1870 settled the relations between the Emperor and what the Englishman calls the "people," and then only in an unimportant context joined to the word "federal." In Germany, instead of "the people" the Englishman speaks of when he talks politics, and the democratic orator, Mr. Bryan, in America is fond of calling the "peopul," there is a "folk," who neither claim to be, nor apparently wish to be, a "people" in the English sense. The German folk have their traditions as the English people have traditions, and their place in the political system as the English people have; but both traditions and place are wholly different from those of the English people; indeed, it may be said are just the reverse of them. The German Emperor believes, and assumes his people to believe, that the Hollenzollern monarch is specially chosen by Heaven to guide and govern a folk entrusted to him as the talent was entrusted to the steward in Scripture. Until 1848, a little over sixty years ago, the Emperor (at that time only King of Prussia) was an absolute, or almost absolute, monarch, supported by soldiers and police, and his wishes were practically law to the folk. In that year, however, owing to the influence of the French Revolution, the King by the gift of a Constitution, abandoned part of his powers, but not any governing powers, to the folk in the form of a parliament, with permission to make laws for itself, though not for him. To pass them, that is; for they were not to carry the laws into execution—that was a matter the King kept, as the Emperor does still, in his own hands. The business of making laws being, as experience shows, provocative of discussion, discussion of argument, and argument of controversy, there now arose a dozen or more parties in the Parliament, each with its own set of controversial opinions, and these the parties applied to the novel and interesting occupation of law-making.